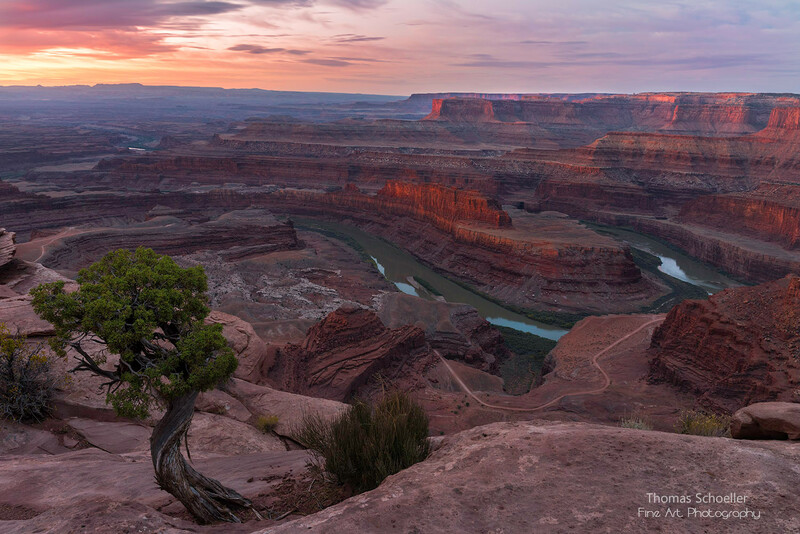 Rosy tones of alpenglow gently kiss the 2,000' canyon walls and mesas that tower over the Colorado River at Dead Horse Point, Utah. This is one of my personal favorite images I've ever made from the great American Southwest as the drama of a new day was unfolding before my eyes. While photographing this inspiring event, it's a challenge to keep your emotions harmonious as you work at capturing the grandeur of such an epic place. I have two most highly recommended large format media options to procure this artwork as. The HD Acrylic Gallery mount (fine art metallic/pearl mounted behind museum grade acrylic glass) or my newest print format which is my AlumaLuxe Plaq's available as float mounted, or mounted over a Black DuraPlaq or Swirled Aluminum DuraPlaq backing. Please call for my AlumaLuxe option.